The Green Man is the only pub remaining in the village in 2016 (here’s its website). 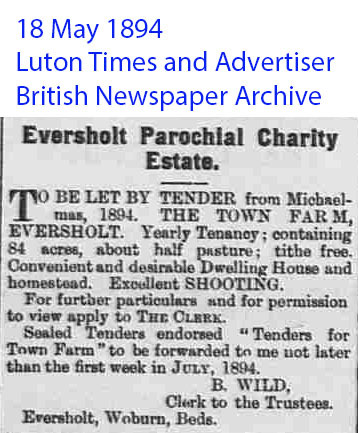 The freehold of the pub is owned by the Eversholt Charity, and seems to have been since at least 1765. 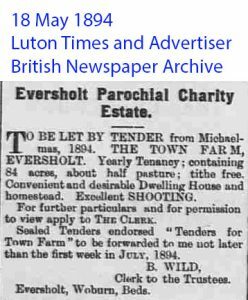 The charity didn’t exist then, but there was something called the Town Estate which managed various properties held in common. The feoffees were the people on the committee that ran the town estate. 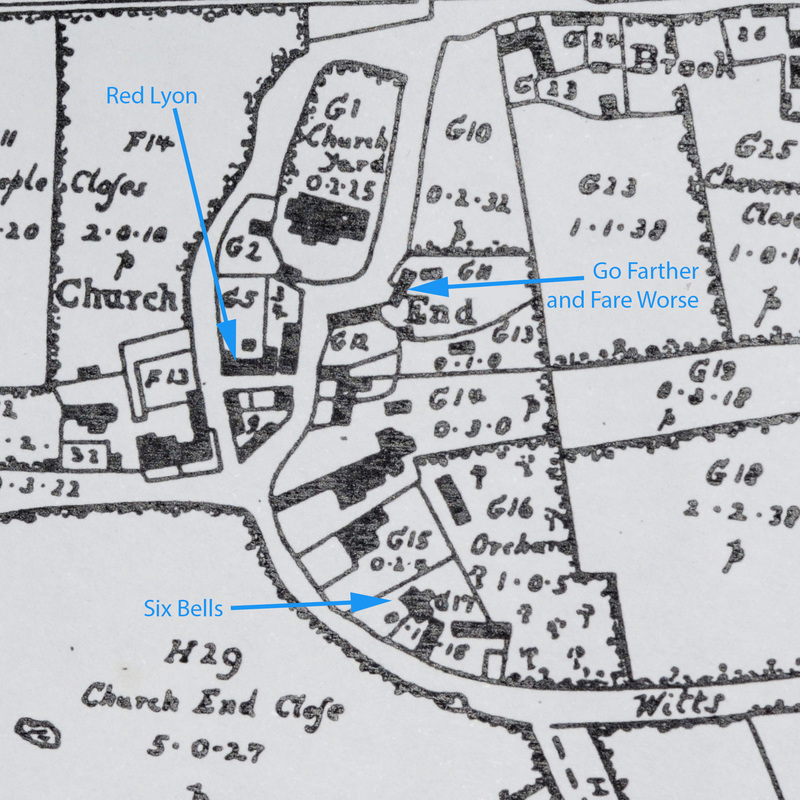 The 1765 map and field book lists the current site of the Green Man as the “Go Farther and Fare Worse”, owned by the feoffees. Detail from the 1765 map. The 1765 Field Book notes that plot G11 was a “Public House called ‘Go Farther and Fare Worse’, brewhouse, orchard”. It was owned by the feoffees and let to Hannah Barton. It was still owned by the feoffees in 1795. That book also notes that plot G12 was called the “Town Yard” and one of the two buildings there was a school house. Plot G13 contained a cowshed. All of these were owned by the feoffees. My (EJW) personal theory is that the pub was never called the “Go Farther and Fare Worse”, but was just the Green Man in 1765. All the other pubs – Falcon, Boot, Six Bells, Roebuck etc – have names that can be easily represented as pictures, which would have been useful in a semiliterate age. “Green Man” is a very old and well known myth that would have been, and still is, a very recognisable picture. “Go Farther and Fare Worse” is a notion very hard to paint as an easily recognisable image. It’s my guess that “Go Farther and Fare Worse” was a tag-line, a notice for the literate, implying “this is the sort of upper-crust pub where people who can read drink”. Maybe, on the day the 1765 surveyor came by, the Green Man sign had fallen off or been taken down for repainting. Or maybe it was present, but just showed the green man picture without any words. The surveyor just made a mistake and took the tag-line as the pub name. Well, that’s my theory, anyway. 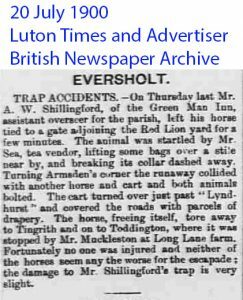 Here’s the first mention of the Green Man that the British Newspaper Archive turns up in a 2017 search. 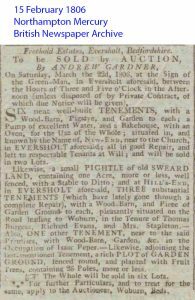 It’s from the Northampton Mercury of 15 February 1806. Click for a bigger version. The 1806 enclosure map lists a “public house and premises” on the same plot, number 287. The building looks the same shape as that on the 1765 map. The 1765 building was replaced in 1835, according to the date on the building gable, with what is now the Green Man. Another possible name change is that the pub might have been called the Sportsman around 1850. This page alleges that Richard Farmer was the licensee from 1847 to 1854, without specifying a source for the information. 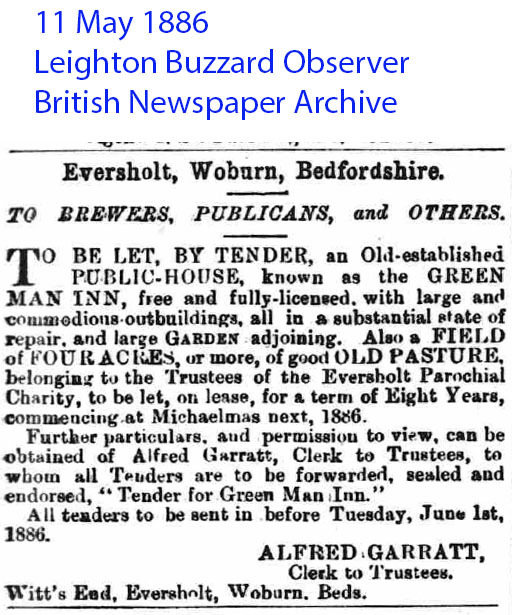 However, Slater’s 1850 Directory asserts that Richard Farmer ran the Sportsman pub (pub, not beer house). The evidence is confusing, and is discussed more on the entry here for the Sportsman. 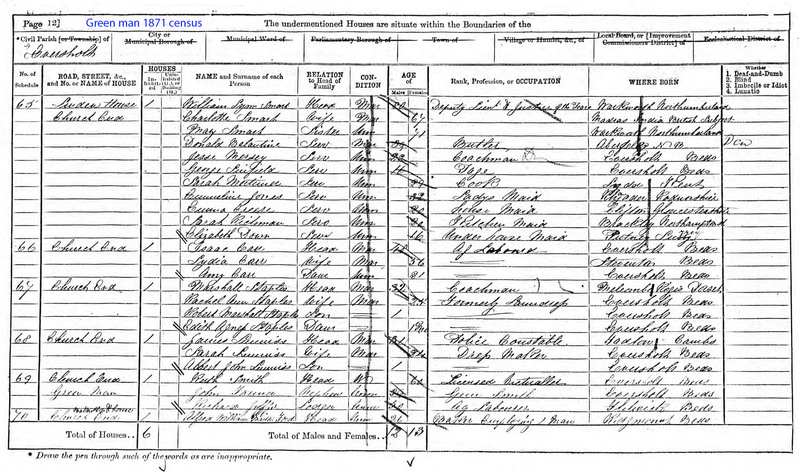 The 1861 census (from Ancestry.com, which seems to allow image reuse) confirms that Ruth Smith ran the Green Man (definitely called the Green man). 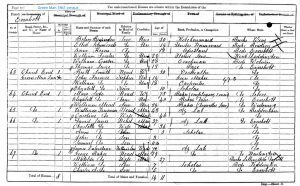 Richard Farmer may have died in 1854, and Ruth, born about 1811, seems to have been a relation, since she is aunt to John Farmer, born about 1842. John is Richard Farmer’s son – more on the Sportsman page. 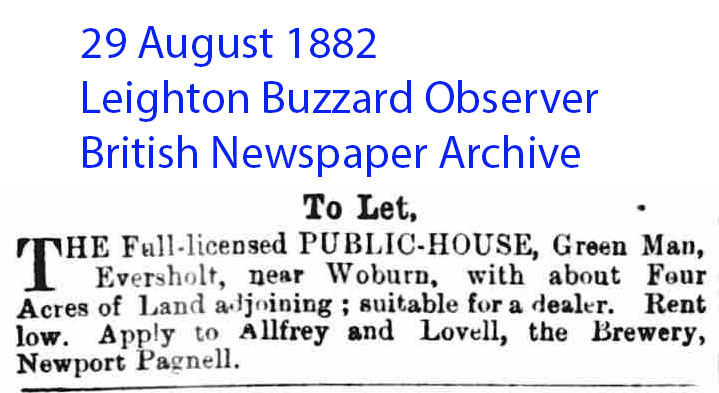 Ruth Smith is still running the pub in 1871. Ruth Smith died about 1882. The table below lists some transfers of the licence, given in the newspaper reports of Woburn court proceedings. Arthur William Shillingford was called up and served in South Africa as a sapper, number 23324, in the 9th Company, Royal Engineers. He was entitled to the Queen’s South Africa Medal with the Cape Colony and Orange Free State clasps. The medal and those particular clasps were awarded to all troops present in the right place at the right time, with no implication that the recipient fought in any action. 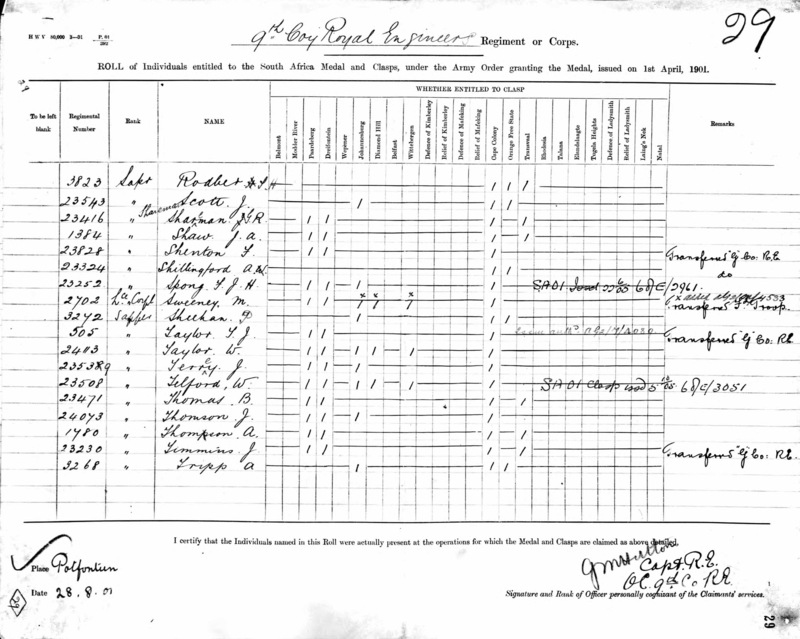 Following this service, Arthur was transferred to G company Royal Engineers. 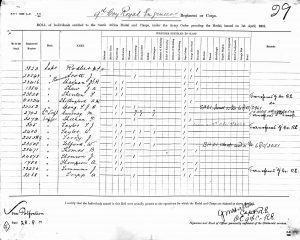 This medla list comes from Ancestry.com, who seem to allow reuse. Click for a bigger version. 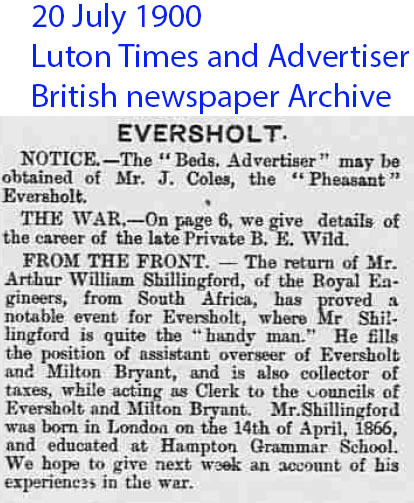 The return of Mr. Arthur William Shillingford, the Royal Engineers, from South Africa, has proved a notable event for Eversholt, where Mr Shillingford is quite the handy man. He fills the position of assistant overseer of Eversholft and Milton Bryant, and is also collector of taxes, while acting as Clerk the councils of Eversholt and Milton Bryant. 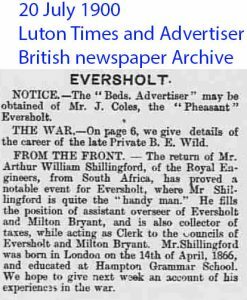 Mr.Shillingford was born in London the 14th of April, 1866, and educated at Hampton Grammar School. We hope to give next an account of his experiences in the war. He had “another month’s sick leave granted” in August, due to return to Chatham on 12 September (Luton Times and Advertiser, 31 August 1900). 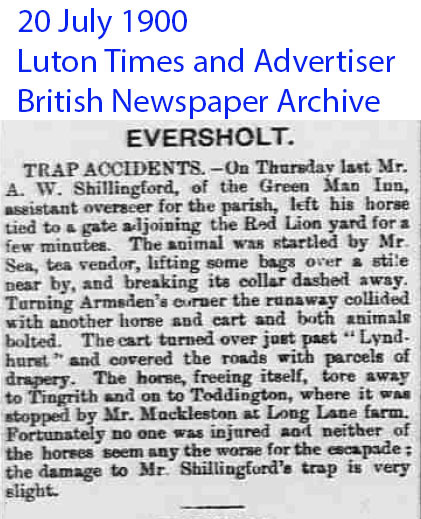 He was invalided home from Bloemfontein, according to the Bedfordshire Mercury of 13 July 1900. I haven’t been able to find any account of his experiences. 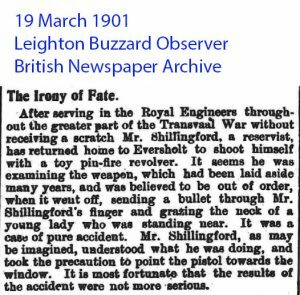 After serving the Royal Engineers throughout the greater part the Transvaal War without receiving a scratch Mr. Shillingford, reservist, has returned home to Eversholt to shoot himself with a toy pin-fire revolver. 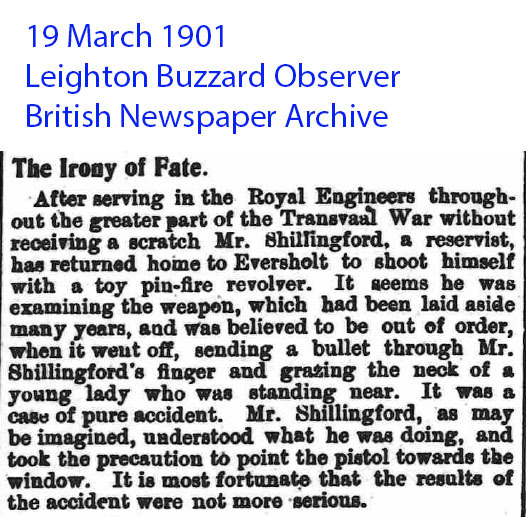 It seems he was examining the weapon, which had been laid aside many years, and was believed to be out of order, when it went off, sending a bullet through Mr. Shillingford’s finger and grazing the neck of a young lady who was standing near. It was case of pure accident. Mr. Shillingford, as may be imagined, understood what he was doing, and took the precaution to point the pistol towards the window. It is most fortunate that the results of the accident were not more serious. 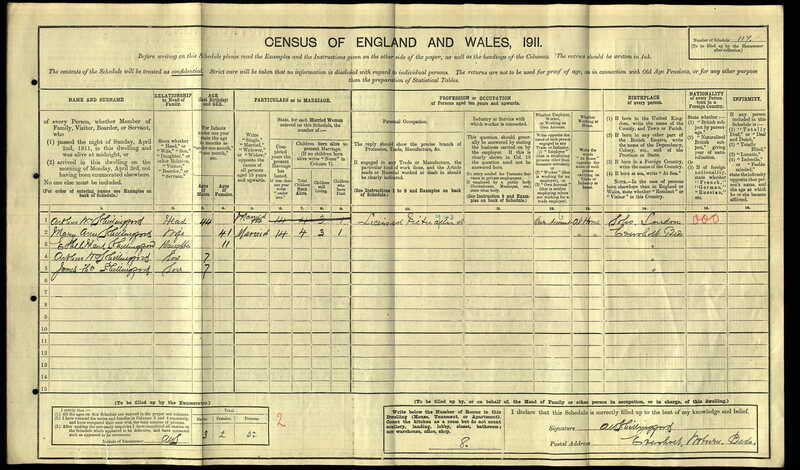 Here’s the 1911 census return for the Green man, showing Arthur back in charge. 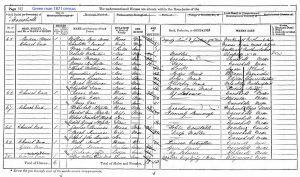 Again, this is from Ancestry.com, and click for a bigger version. Assault.—John Smith, John Brazier, and William Brazier were each fined £6 and 10s. costs, for on the 11th October, assaulting Joel Bunker, of the Green Man public-house, Eversholt. 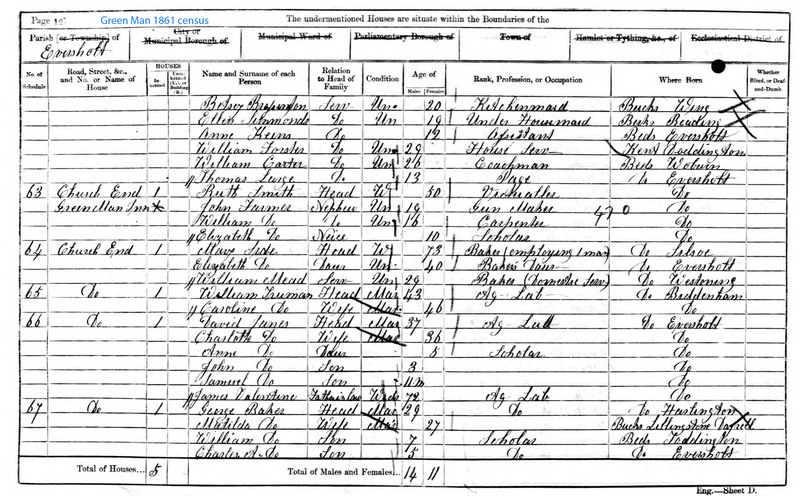 As an aside, the 1841 census lists not only Joel Bunker as a publican, but Joseph Bunker, of Brook End, as a brewer. Joel Bunker, of the Green Man, Eversholt, had 73 measures taken from him. He was only fined £1, and 7s. 6d. costs. 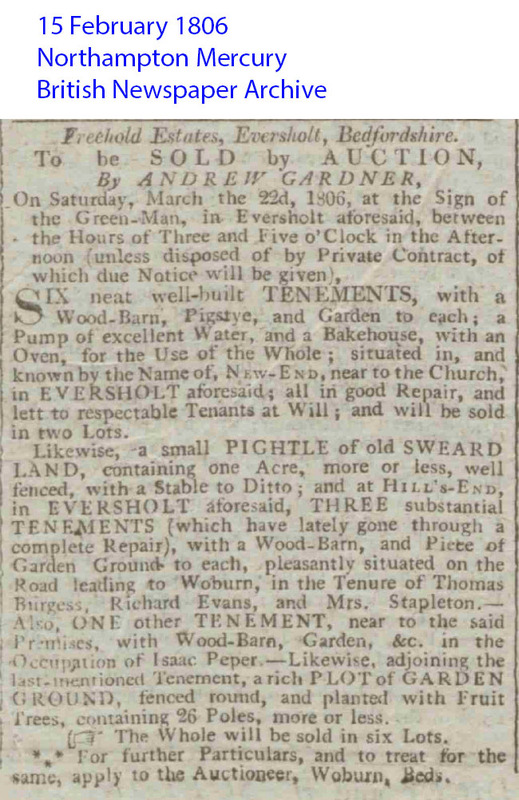 TO BE SOLD BY AUCTION, By F. WHITLOCK, On Friday, September 25, 1846, the premises, the property of MR. JOEL BUNKER, the Green Man Public-House, Eversholt (aforesaid), who is leaving the neighbourhood, ALL the genuine HOUSEHOLD FURNITURE, LINEN. CHINA, Rick well-got HAY (about six tons), two single-barrel GUNS,useful GIG, and other Effects. The sale will commence Ten o’clock precisely. The above valuable property may be viewed on the day preceding and morning of the sale. Catalogues may be obtained at the principal Inns of the Neighbourhood, and the Auctioneer and …, Woburn, Beds. 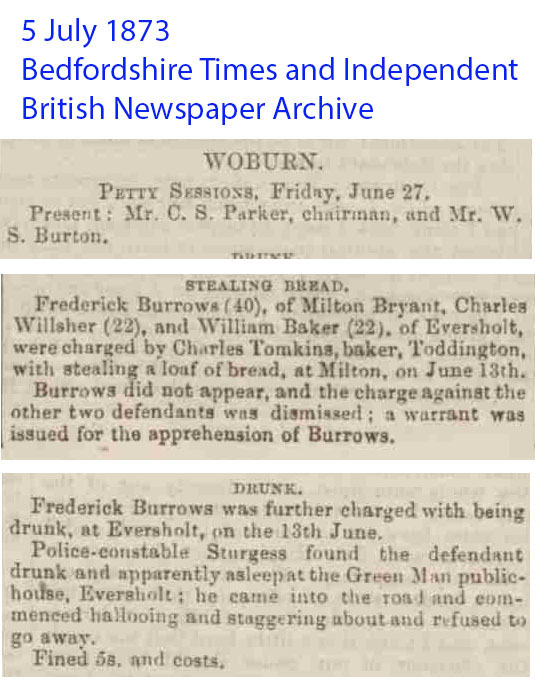 Joseph Boxford, Thomas Whitbread, and Frederick Smith, labourers, of Eversholt, were summoned for having been disorderly on the licenced premises of the Green Man Inn, at Eversholt, and refused to quit when requested. The men created a brawl, and had to be turned out. 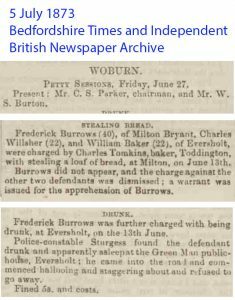 Boxford, who appeared have been the primary causeof the disturbance, was fined 10s. and 14s. 6d. costs; Whitbread was ordered pay costs of proceeding against him; and the charge against Smith was dismissed. The Green Man was called the “Go Farther and Fare Worse” in the 1765 map and field book. 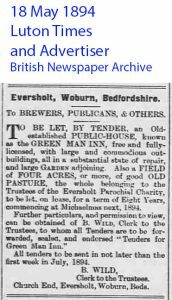 The British Newspaper Archive turns up many mentions of the Green Man in Eversholt starting from 1806, mostly as the venue for auctions. It’s not clear whether their archive just doesn’t have the right papers earlier. There are no mentions of the “Go Farther and Fare Worse” in it. 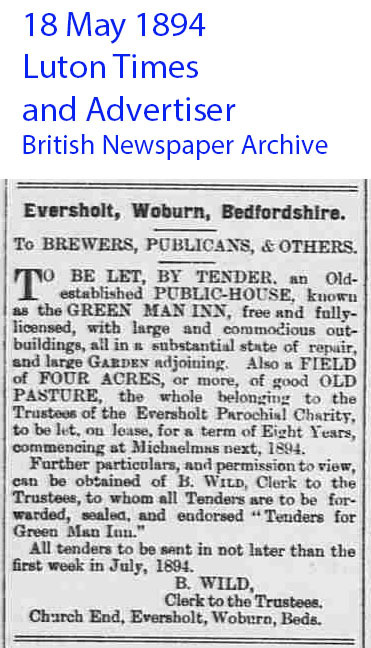 Joel Bunker put the Green Man up for auction on 25 September 1846 (text from newspaper above) claiming it was his property. How could that be? It belonged to the feoffees. Ah, perhaps there is the word “on” missing before “the premises” from the OCR’d text. Anyway, there are no more auction notices, nor court reports of drunkenness. 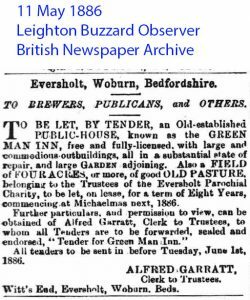 There is a mention of the “Sportsman public house, Eversholt” in the Saturday 09 March 1833 edition of the Huntingdon, Bedford & Peterborough Gazette. To be chased down! More there! This page asserts that Richard Farmer was licensee from 1847 to 1854. It offers no hint as to what happened from 1844 to 1847 or from 1854 to 1863, when Ruth Smith took over. Slater’s 1850 directory lists the Sportsman, run by Richard Farmer, in Eversholt. 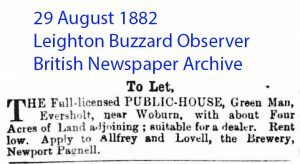 A pub called The Sportsman is mentioned in a small ad for an auction catalogue in the 11 September 1869 edition of the Luton Times and Advertiser. 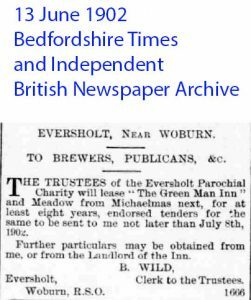 There are no other mentions at all of either the Green Man or the Sportsman pub in Eversholt in any British Newspaper Archive files between November 1844 and September 1863. Did the name change to the “The Sportsman”? 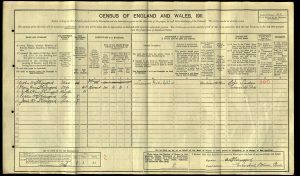 Freebmd has a death record for a Richard Farmer in Q4 1957 and a marriage record, probably to Elizabeth Green, in Q2 1838. Richard Farmer, born 1813, is not the same person as Richard Farmer Harris, who was born in 1838. The next mention of Green Man in the British Newspaper Archive is 5 Sep 1863, when the Bedfordshire Times and Independent mentions that Ruth Smith is the licensee. Auction notices and occasional drunkenness resume. It seems that the pub has been known as the Green man since that time. Letting Ads for the Green Man from the charity. Click for big versions.